The CSR 1000v is based on the same IOS XE code that runs on the ASR 1000, which supports both OTV and LISP. So I decided to try to build a lab to test VM mobility using OTV and LISP in my home lab using a number of CSR 1000v instances. Note: The CSR runs IOS-XE, not NX-OS, and as a result it uses a different command set to configure OTV and LISP. In that sense, it cannot replace practicing with actual Nexus gear for the purposes of exam preparation. However, it does allow you to examine the underlying structures and mechanisms of the technologies, and it allows you to get an idea of the common configuration elements in an OTV or LISP configuration. I create two separate VLANs on my vSWITCH which I intend to bridge together using OTV between the routers “dc1-otv” and “dc2-otv”. I create two VMs, one in each VLAN, to which I assign IP addresses from the same IP subnet 192.168.200.0/24. VM “VM-1” gets IP address 192.168.200.1 and “VM-2” gets 192.168.200.2. The routers “dc1-xtr”, “dc2-xtr”, and “branch-xtr” will be configured as LISP xTRs later. Note: Unlike the Nexus 7000, the CSR requires multicast routing to be enabled in order to enable the IGMP functionality that is required for OTV. On the Nexus 7000 it is not necessary to enable multicast routing and PIM. Simply setting the IGMP version to 3 is sufficient on that platform. These commmands essentially create a bridged domain on the router, which is then associated with interface GigabitEthernet2 for frames that carry an 802.1Q VLAN tag of 2001. For more information about Ethernet Service Instances refer to Configuring Ethernet Virtual Connections on the Cisco ASR 1000 Series Router in the ASR 1000 configuration guide. In this lab the site bridge-domain configuration is pretty meaningless, because there is only a single OTV edge device per site. Therefore, I just attached the bridge-group to an arbitrary interface and VLAN tag, to simply ensure that the overlay interface would become operational. In reality, you should take care that the VLAN selected for the site bridge-domain is properly extended between OTV edge devices within the site, but not carried across the overlay. This configuration is a little peculiar, which has to do with the specifics of my lab setup. The intention is to create a single VLAN 200 stretched across the two DC sites. However, in my lab this is all setup on a common virtual infrastructure. To still create two separate “VLAN 200” instances I essentially created two VMware port-groups and associated VLANS (VLAN 201 and VLAN 202). 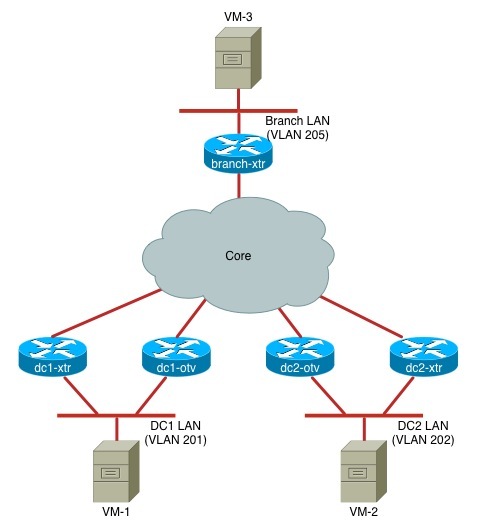 CSR dc1-otv and VM-1 are both connected to VLAN 201. Similarly, CSR dc2-otv and VM-2 are connected to VLAN 202 (see diagram). As a result, the “VLAN 200” frames arrive as untagged frames on the internal interfaces of CSR dc1-otv and dc2-otv. These frames then need to be bridged across the cloud as VLAN 200 frames. In a more realistic scenario the frames would already arrive with VLAN 200 tags on the internal interfaces and the rewrite commands would be unnecessary. The ping succeeds, confirming that OTV is operational. Update: Brantley Richbourg and Brandon Farmer pointed out in the comments that this ping fails if you don’t have your VMware vSwitch set to accept promiscuous mode. Initially, I didn’t notice this behavior, because I already had my vSwitch set to accept promiscuous mode for different reasons. I retested the lab with promiscuous mode set to “reject” and confirmed that this stops the ping from working. The explanation for this behavior is that the frames from VM-1 to VM-2 have the VM-2 MAC address as the destination MAC address, which is not registered to the CSR virtual NIC. For unicast MAC frames, the vSwitch normally only sends frames with a particular destination MAC address to the VM that is associated with this MAC address (if it is local) or to an uplink (if it is remote). Therefore, the VM-1 to VM-2 frame is not sent to the CSR VM, so the CSR never sees the frame. As a result, the frame cannot be forwarded across the overlay. When promiscuous mode is set to “accept” on the vSwitch, the CSR receives all traffic on VLAN 201, allowing it to forward the VM-1 to VM-2 traffic across the overlay. So, if this ping fails in your lab, make sure that you have your vSwitch set to accept promiscuous mode! Thanks to Brantley and Brandon for pointing out this potential issue with the lab setup! Although it is usually not necessary to dive into the IS-IS database that is used by the OTV control plane, it is nice to be able to take a peek under the hood. So now that we have a working OTV setup that extends VLAN 200 and the corresponding subnet 192.168.200.0/24 across the two DC sites, it is time to add LISP to optimize the inbound routing for mobile VMs. As it turns out, OTV on the CSR has FHRP filtering built-in and enabled by default. This means that it is not necessary to configure customized access-lists to filter HSRP hellos across the overlay. Interestingly enough, it does seem to advertise the HSRP MAC address through OTV IS-IS. When you configure manual FHRP filtering on a Nexus 7000 you would usually suppress these advertisements as well as the actual HSRP packets. It looks like this behavior on the CSR could lead to continual MAC updates for the HSRP MAC address, which in turn could affect control plane stability. This may be a point worth investigating further if you are considering deploying CSR/ASR-based OTV in production. On the other hand, I really like the fact that the CSR has FHRP filtering straight out of the box and that it is controllable through a simple command (otv filter-fhrp), rather than a cumbersome access-list configuration. Now that we have verified the basic setup we can start on the actual LISP configuration. I start by configuring my LISP map-server and map-resolver. I want to make these vital functions redundant and I want to separate these functions from the LISP tunnel routers (xTR) to keep the configurations a bit cleaner. Although it is definitely possible to put the map-server/map-resolver functions on a router that also acts as a LISP xTR, I think this might make the configurations a bit harder to understand. Also, I intend to take some LISP sniffer traces on this lab later and having separate IP addresses for the different functions will make these traces more easily readable. I added the accept-more-specifics keyword to the EID prefix to allow registration of individual mobile /32 routes later. To make the LISP resolver function redundant I add an anycast address (10.37.37.37) to both dc1-otv and dc2-otv. This address will be configured as the LISP map-resolver address on the LISP xTRs. Note: When configuring anycast IP addresses on routers, you should take proper care that these addresses never get selected as a router ID for any routing protocol. This is why I specifically configured the OSPF router ID on these routers using the router-id command. The only real difference between these configurations is the locator IP address, which is 10.200.200.3 for DC1 and 10.200.200.4 for DC2. For the mobile VMs I selected a sub-prefix of the overall 192.168.200.0/24 prefix that belongs to the twin-DC site. Of course, I could also have used the complete prefix for mobility. In that case the regular LISP database mapping for that prefix should be removed. Note: There is one other thing that is specifically worth noting about this configuration: I configured the link-local multicast group 224.0.0.100 as the LISP map-notify group. This is not a best practice and I should have used a regular ASM multicast group (for example 239.1.1.1). However, when I first configured LISP using a random 239.0.0.0/8 ASM group I was experiencing all sorts of problems. 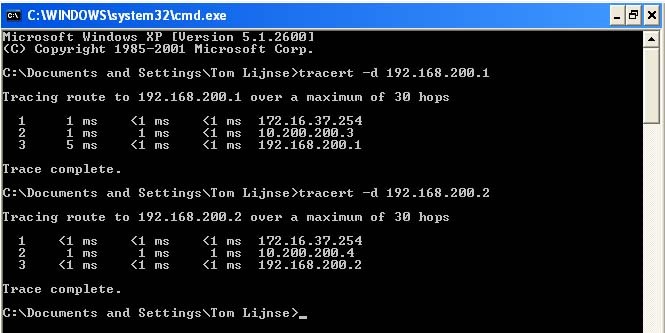 My VMs were reporting duplicate IP addresses and the traceroutes from VM-3 were inconsistent. After a couple of hours of troubleshooting, I finally figured out that this was caused by the fact that the LISP map-notify multicast group wasn’t properly forwarded across OTV between routers dc1-xtr and dc2-xtr. I tried to tackle this problem in various ways, including converting my OTV configuration to a unicast setup with adjacency servers, but to no avail. In the end I started suspecting IGMP snooping (or the lack thereof) in the whole chain of vSwitches, bridge-domains, and OTV to be the cause of the problem. To test this hypothesis I decided to change the multicast group to a link-local group, because those groups should always be flooded within a VLAN regardless of IGMP snooping. It is a bit of a hack, and clearly it isn’t a real solution for the underlying multicast problem. But at least implementing this workaround allowed me to further concentrate on LISP rather than an obscure multicast issue. I am hoping that this is a VMware vSwitch problem, rather than an OTV multicast problem, but further testing is needed to pinpoint the issue. At this point, we have a working configuration combining OTV with LISP mobility, which is a good base for further experimentation with these protocols. Despite the multicast problems that I experienced, I feel that a virtual lab setup with a couple of CSR 1000v’s is a nice addition to the toolbox for testing advanced routing and data center technologies like LISP and OTV. Note: For those that want to try this out in their own labs, I published my complete configurations for reference here. This entry was posted in Networking and tagged cisco, ios, lisp, otv by Tom. Bookmark the permalink. Erg leuke blog ! Ik was zelf al aan het testen met de CSR en 1000V maar dit ga ik ook zeker proberen ! Dankjewel! En veel plezier met het testen. Thanks for the effort on this blog, I was just thinking the same thing as my first CSR 1000v project. So google brought me here. I was able to get OTV working in my lab using your config, and also with Adjacency server in unicast mode. Having issues getting OTV to continue working when I bring up a 3rd site at my corporate data center on a spare ESXi host. Apparently OTV’s ISIS uses IIH padding to 1422 byte PDU’s for the hello packets, and I tried setting the otv isis lsp-mtu to 1000, to force it to drop down, and well no change. Then I set the CLNS Mtu on the join interface and the overlay interface, and the OTV came up, but I couldn’t get traffic to pass across it. So I need a good config for using this with a less than 1500 byte MTU on the join interface, in order to lab it across my VPN tunnel. Glad to see this post was useful to somebody else getting their feet wet with the CSR 1000v. I just quickly labbed up a simple three site scenario (all sites on the same vSwitch, no IPSec, no MTU tweaking) and that worked fine, both in multicast and unicast mode. Of course packets larger than 1458 bytes won’t go across the overlay, because of the 1500 byte MTU on the join interface. Other than that, OTV seems to work fine in the straightforward three-DC case. So it does indeed seem that your IPSec VPN setup is causing the trouble, not OTV itself. Are you configuring the IPSec tunnels on the CSR? Or is the tunnelling and encryption performed on a separate router behind the join interface? To be honest, what you are trying to achieve probably isn’t even possible to begin with. As far as I know, the transport network for OTV should simply have an MTU that is 42 bytes larger than the MTU on your inside interfaces. So to me it looks like carrying OTV across an IPSec-based network with a significantly smaller MTU won’t be possible. However, it is always worth giving it a try anyway, to better understand the exact limitations of the technology. Also it sounds like you almost got it to work, in the sense that you at least managed to the OTV control plane online. If you want you can unicast me your configurations and I can have a look to see if I can get it to work, or if I can spot where it goes wrong. Fantastic Blog! I have not attempted the LISP portion yet, but this write up was just what I needed to get OTV working on my lab ESXi host. Now I can demo this to customers and also use it for preparing for the CCNP Data Center. Thanks for taking the time to document this. Like Brian, I wanted to use the CSR to configure all of this stuff to learn, and google led me to your blog. This saved me A LOT of time. Not sure what your vCenter configuration looks like, but I configured this as an vApp called OTV, so that I can turn on my OTV lab when I need it and power it off when I don’t. Another thing I ran into was all vSwitches need to be set to allow promiscuous mode. I ran into issues getting things to work under the default vSwitch settings which reject promiscuous mode. I don’t recall if you mentioned that, but if not, I thought I would. Thanks for the positive feedback! It is nice to hear that my post was helpful in getting you started with OTV on the CSR. I also appreciate the note about promiscuous mode on the vSwitch. I didn’t actually notice that this was a requirement for the lab to run, because I already had my vSwitch set to promiscuous. I use the same ESXi host to run a nested ESXi environment, which also requires promiscuous mode. So for me it just worked from the start. I’ll have to experiment a bit to see which part of the setup breaks if I turn off promiscuous mode. Were you able to pinpoint exactly which functionality was lost without promiscuous mode? I retested the lab with promiscuous mode set to “reject” on my vSwitch and indeed, as expected based on your feedback, the ping from VM-1 to VM-2 fails. The OTV control plane between the CSRs is still functional and also ARP between the VMs still works, but the ICMP echo from VM-1 to VM-2 never makes it across the overlay. The reason for this behavior is that these frames are addressed to the VM-2 MAC address, which is not associated with the CSR. So without promiscuous mode, the CSR never sees these frames and as a result, it cannot forward them across the overlay. I added a note to the post to point out this issue. Thank you very much for bringing this to my attention and helping me to improve this post! This is a great write-up — thank you for all your efforts. In regards to Promiscuous mode on the vSwitch — it seems that disabling this prevents OTV from functioning, so definitely make a note that promiscuous mode must be enabled. As a side note, and I believe it’s because of the promiscuous mode, but I got side tracked digging into what I thought was a configuration problem because I was seeing duplicate ping responses no matter what I targeted. Turns out that Linux boxes will show you the duplicate responses, but Windows boxes wont! So in the end my OTV was working properly the whole time, even though, as you mentioned, the peculiarities of using the VM environment mean it’s not exactly the same as if you were using dedicated hardware. Glad you liked my write-up! Thanks for confirming the issue with promiscuous mode. I just retested the lab and added a note to point out this issue. With regards to the duplicate ping responses: When I retested the lab, I also checked to see if I could replicate this issue, but I didn’t see any packet duplication. I took a sniffer trace on VLAN 201 and I only see a single ICMP echo-reply coming back from VM-2 for every ICMP echo sent by VM-1. I am wondering what is happening in your setup. Do you have any idea which device is generating the duplicate ping responses? Thanks for helping me improve this post! On another note, the command reference mentions that all LISP VM-router interfaces (the ones configured with a dynamic-eid policy) must have the same MAC address — did you configure a static MAC on both DC1/DC2-XTR interfaces? Because I was focusing on the “OTV doesn’t work without promiscuous mode” aspect, I only turned up the OTV routers, not the LISP xTRs. So if your xTRs are generating the duplicate packets then it makes sense that I didn’t see them in the simple OTV scenario. I’ll do a proper retest with the complete setup and let you know if I also get the duplicates in that case. With regards to the static MAC address: I didn’t configure static MACs in my lab. I would have noted that in the post, if I had. However, I am wondering whether this is really a strict requirement for the LISP mobility, or just something that you would do to keep the default gateway MAC address identical so you don’t have to wait for ARP timeout on the VM after the move. In my case having an identical HSRP configuration on both sites combined with the built-in HSRP filtering in the CSR OTV implementation ensures that the default gateway MAC is identical on both sites. For that reason, I did not bother adjusting the actual interface MACs. I may have overlooked something there, so if you could point me to the statement in the command reference I’ll have a look. I’ll get back to you with more feedback as soon I have done a proper retest. I repeated my tests with the complete lab setup, including the xTRs, but I am still not seeing any packet duplication. It looks like there is some subtle difference in your lab setup. I added a note to the end of my post with a link to a zip file that contains my complete configurations for reference. You could have a look at them and see if you can spot any differences with your configurations. Thanks for putting those configs up. I examined your configs and couldn’t find any meaningful difference that would cause the duplicate packets. I’m running ESX 5.1U1, using the latest CSR 1000V release (3.10.0s). It occurred to me that I could be running different code, so I went and downloaded the CSR version that predated your post (3.9.0aS) and copied my exact XTR config onto those devices. And what do you know — no duplicates. So now all of the routers except the XTR’s are running 3.10.0s, and the XTR’s have 3.9.0aS. I looked over the release notes and I couldn’t find anything between the two versions that I thought could cause the behavior I’m seeing. I wanted to try 3.9.1S as well, but I was unable to download it without a contract. So again, thanks for digging into this problem with me. At this point I’m going to chalk it up to a code difference, although I don’t have a definitive cause. My routers were indeed on 3.9.0aS, so that is consistent with what you’re seeing. To me it looks like you’re hitting some bug that was introduced in the 3.10.0S code. From a technology standpoint I can’t come up with any good reason why you would want the xTR to replicate packets, so the fact that it doesn’t do this on 3.9.0aS, but then suddenly does on 3.10.0S makes me think that this behavior is simply a bug in the code. It may be worth retesting when the next release comes out, but for now this seems to be the best explanation. Its the promiscious Port Group. You can’t have anything else in that promiscous group with your OTV Internal. You have to use a Layer 2 switch to bridge the port groups. Promiscuous mode is like a multi port span session. You see every packet on every interface inbound and outbound for every other port. Ah, okay. That’s good to know. I hadn’t really thought of the port-group as a multi-port span session, but that makes sense and also explains the potential for creating bridging loops. Thanks for digging into this issue and providing feedback! Yes you have to have the Port Group in Promiscuous Mode. Also you only want the OTV Internal Interface and a single Uplink interface on that port group. If you try to do this in a Cisco UCS environment and you have 2 uplinks, you will create a network loop. The reason you saw the HSRP virtual Mac Address on the OTV was because you had other interfaces from other VmWare hosts including your HSRP interface on that same port group. Promiscuous mode is like a Port Mirror, you only want your CSR and your UPLink to be “Mirrored” any other interfaces will confuse the Mac Table. I have my OTV in production and we did DR testing today. I have been fighting the promiscuous mode issues for a while. I now see the value of the Nexus 1000v… However with just the OTV-Internal and the single Uplink on the port group the CSR works fine. Cool! Very nice to see somebody actually run OTV on the CSR in production! Also, great job on solving the fragmentation and promiscuous mode issues! It looks like the CSR OTV solution is actually even more flexible than I thought it to be. Many thanks for digging into the issues and providing such great feedback! An update, I have moved one of the Call Managers to the DR site, replicating DB to sub over OTV. We also did a partial failover test this weekend, failing 12 of our servers and running them from DR while they used resources in Primary site. I’m doing some LISP on CSR1000v proof of concept labs with production PxTRs and MS/MRs. Configuring the CSR1000v with the “ip tcp adjust-mss 1360” command on the interface did not seem to change the MSS in the TCP packets. Has anyone experimented with MSS adjustment on the CSR1000v? I’m still investigating and doing some packet captures to see what is happening. From a PC behind the CSR, I would have most of the cisco.com pages load, but not others. Sites like yahoo.com and google.com would not load at all. I do not believe that it was a LISP transport issue. I personally never tried the combination of LISP and TCP MSS adjustment. However, it is really hard to judge why this might not work without knowing a bit more about your configuration. Are you doing just LISP? Or LISP and OTV? And on which interface are you configuring the MSS adjustment. It would be helpful to have some sort of a diagram and the relevant pieces of the configuration. using hsrp option “use-bia”,i could ping to hsrp vip without permitting promiscuous mode. I should probably rebuild this lab sometime with a more recent version of the CSR and ESXi. Which part of the configuration are you looking for exactly? It is a bit hard to capture all the details of an ESXi configuration in a single screenshot. Could you maybe specify which parts of my setup are unclear or missing? Just to give you a general idea, I am running a pretty basic setup: I have installed ESXi free on a Dell desktop with 16 GB of RAM and a quad-core i5 processor. I use iSCSI and NFS to connect to the data stores on my Synology NAS. Because I am using ESXi free, the networking setup isn’t very fancy either. Just a vSwitch with a bunch of port groups to create some VLANs to connect my CSRs to. In some cases I use a port group configured for “VLAN 4095” to allow 802.1Q trunking from the port on the CSR. Please let me know if there are specific details that you’re looking for. I just sent you a couple of screenshots. Just email me directly if you have any other questions about the setup. Thanks for the excellent write up. Just passed my CCIE DC written exam and i was wondering how i was going to lab some of the items. I am glad to hear the post was helpful. Good luck with your studies! GREAT article and just as good dialog in the comments. Tom, could you send over those same screenshots for the port groups, I’m just interested how to place the connections. I have all 5 csr’s built on a pair of ESX hosts , with 3750 switches between so I can do about any setup needed. Thanks, just finished ccie DC Lab so , anxious to just tinker with LISP for awhile. Thanks for the positive feedback! I am always happy to hear that the post was useful to somebody. I sent the screenshots as requested. Let me know if you have further questions. did not appear to have any effect one way or another on multicast forwarding. Maybe something is changing in the code from revision to revision (I’m using 3.12) were you actually able to demonstrate bidirectional multicast forwarding with your config? That is interesting. As far as I know “ip pim passive” should also enable IGMP on the interface. (And from my note about the difference between CSR and Nexus it seems like I tested without the “ip pim passive” first and then added it to make it work). However, it is too long ago that I ran this setup to know for sure if I had bidirectional multicast working or not. Was your lab setup exactly the same as mine (everything on a single vSwitch)? Or did you have physical switches somewhere in the path? I am wondering whether this has anything to do with IGMP snooping operation in the L2 switched part of the network. I only used vswitches, each CSR was on a different physical host. Then the possible culprit could be IGMP snooping on the physical switch. Your situation is different from mine, because I had both CSRs on the same vSwitch, which means I didn’t have to deal with multicast forwarding on the physical network. I still think that “ip pim passive” should also enable the IGMP querier function, and therefore IGMP snooping should have operated correctly, but it is hard to say without rebuilding the lab and debugging the multicast operation. Also, IGMP snooping operation is implemented differently on different switches, so it may depend on the type of physical switch that you are using in your lab. This would be worth digging into if at some point I rebuild my lab the same way you set it up, using two different hosts. Great write-up and article. I actually just set up a lab this past week with OTV/LISP on CSR1000v. Did you have any strange issues in your lab with guest traffic to the VM breaking once you turned up the overlay? A debug ip packet just shows my CSR stops receiving traffic the minute I turn up the overlay, which is bizarre since the join interface is totally separate from my internal facing SI. The join interfaces and the internal interfaces of the CSRs are on different port-groups and my “mobility” is facilitated by a port-group change on the guest. Promiscuous mode doesn’t seem to fix it, either. No, I haven’t seen that behavior. Hopefully somebody else has run into it and can provide you some clues. It’s been quite a while since I last tested this lab.